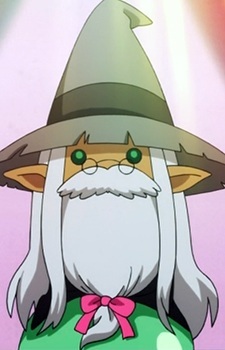 Moldavite is the Headmaster of the Magic Academy, where the Jewelpets attend to learn about magic. He's also Rin's partner in Jewelpet Twinkle and has a close relation with Jewelina. Although he retains his position as Headmaster, he's very jolly, likes karaoke and orders a lot of magic stuff through the magical mail order. He often ends up getting scolded or punished by Halite. Despite his antics, his magical level about the same level as Jewelina's.